Migration (mainly from eastern to western European countries), retirement and a trend among nurses and midwives to leave the professions (in search of better incomes and career opportunities) also contribute to the shortage. Nevertheless, the number of nurses whose education has prepared them to take over advanced practice roles is currently not sufficient. This deficiency is expected to continue through the next decade. Although progress is being made in standardizing professional education in the European Union, in 2009 attaining a bachelor's degree requires three years of study for nurses in Italy and six years for nurses in Germany (three years of vocational training followed by three years of study). The higher the proportion of academically prepared nurses in a country, the more likely nurses are to be involved in decision-making. The chief nursing officer or government chief nurse in the health ministry is considered to have the most influential role for nurses in decision-making in most countries. Nevertheless, some countries have established departments or divisions in ministries of health that are responsible for nursing care. Some national nursing and national midwifery associations use the media to influence policy and to communicate their messages to a wider audience. The Royal College of Nursing (Wales), for example, has a regular feature in the most widely read regional newspaper, where it raises and discusses nursing issues. Nurses' and midwives' salaries are still below the national average in many countries in the European Region. 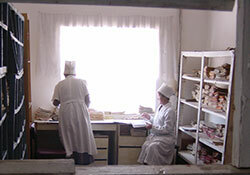 In almost all countries in the Region, over 90% of nurses and midwives are female. As salaries for women in general continue to be lower than those for men, nurses receive lower payment than employees in comparable public services that are more male dominated.